We need 18,000 more signatures by September 13, 2015 to get an official response from White Hosue. Federal Judge Revoked STEM OPT Extension Rule on August 12, 2015. But, DHS was given an opportunity to fix the STEM OPT extension rule via notice and comment rule making process. 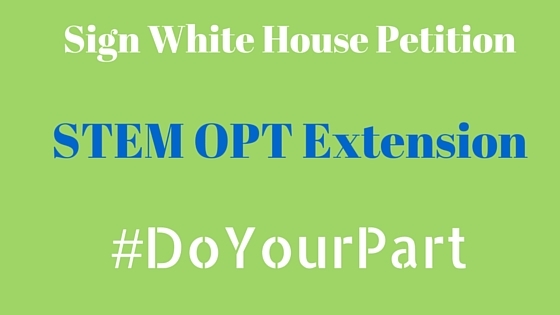 You have to sign STEM OPT Extension White House petition today. There’s no official word from DHS or ICE or USCIS on how they are going to respond to this Rule. But, you the people have power to make things happen. There are over 800,000 International Students studying in America. We have enough students in the USA to sign the White House Petition for STEM OPT to reach 100,000 signatures. Do Your Part. If you want to walk door to door to have your friends sign it, then do it. Ask yourself – What’s Next for me? What’s the Pain I have to endure, if this STEM OPT Rule is not extended? Think about the impact to your and your family and career. Let’s get to 100,000 signatures within next 10 Days. Without 17 months STEM OPT Extension, you will have just one chance to apply for H-1B Visa. With lottery that’s not enough to get H1B to work here in the America. Don’t wait for someone else will take care of this problem. This is your problem. Make sure your voice is heard. Once, we reach 100,00 signatures, if DHS does the Rule Making, you have to comment on the proposed rule. That comes next. But, let’s take care of the problem at hand. Let’s get an official reply from the White House. Now we have got 1 lakh signature in the white house petetion.When will we receive any new update regarding stem OPT extension?. Received more than 100,000 signatures! So What’s next? We will get an official reply from White House. Reply will be more along the following lines. So, lets wait and see. This petition is to show, the strength and voice we have as Students and Scholars. When rule making starts, same folks who signed should comment on the proposed rule. Remember, people who oppose this will also comments on this. It’s not simple count of yes vs no’s for this rule to be implemented. Please extend the stem opt!don’t revoke it! Kudos. Finally some big movement since yesterday. 17,000 to 13,000. Way to go! Lets create a wave on twitter, facebook and all media available. Lets aim hit the target in 5 days. This is it. If we do not stand united in this cause, international F1 students are all doomed. If your friends or relatives think its a pain to enter details – one idea is we do it on their behalf and they just click the link they get as verification in their inbox. As Raghu said its our life and we must play the active part. I’ve heard that, almost all the petitions that crossed 100,000 were successfully processed. Do you think this really makes a difference in this case? What are the chances if it crosses 100,000 on time? Yes. So spread the word. Whoever has signed so far – tell each one to get 1 more signature (from a friend or relative or whoever is nearby!) This way it can hit 100000 in a matter of days. Post this idea on all forums, facebook, twitter, etc. I have spread the news to my friends and relatives. I see that the number of signs started going up from yesterday which is a good thing! We will get an official update from White Hosue if the petition reaches 100,000. Plus this will show we have support and move things forward. Our job is not done after petition reaches 100,000 signatures. We need to get DHS to move forward with Rule Making process as well. For now, let’s get this done. Then, let’s start another campaign for DHS.